If you are looking for some plants that will give you a real show in winter and spring, thrive in part shade, look after themselves and keep down the weeds you could do far worse than copy this combination that was photographed at Cambridge Botanic Garden but is repeated endlessly around the globe. 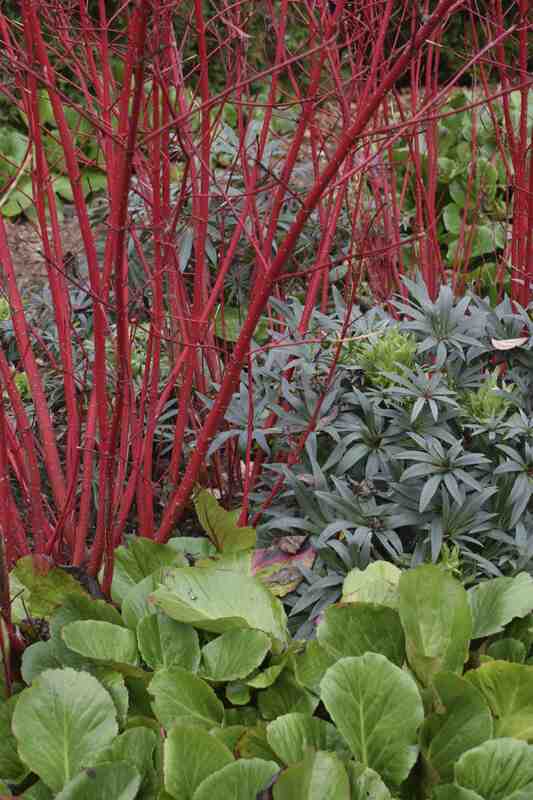 Height and bright red stems are provided by Cornus alba ‘Sibirica’ which glows in the winter sun. If you can’t stand the green foliage in summer then the variegated ‘Elegantissima’ may be a better choice though the stems are not as bright. You have to curtail the display a little by pruning in March every year or two to keep the shrub in shape and to encourage lots of young, bright stems. Under this are the filigree, dark leaves of Helleborus foetidus, a native species that is one of the shrubby species that forms biennial stems, like many euphorbias. In spring the new shoots grow, forming buds in the tips in winter, that bloom in spring. When the flowers fade you should cut the stems down to the ground because they will naturally die anyway and it prevents aphids devastating the plant. This is a plant that will tolerate chalky soils and even dense shade and dry soils under trees. The flowers are green, edged with maroon, and no huge but the apple green contrasts well with the dark foliage. And to contrast in foliage colour, shape, size and form, the rubbery leaves of bergenia make up the third perfect plant. You could add your own twist on this with a bergenia that colours red in winter and there is the possibility of flowers in shades from white through pink to magenta. Once planted, this is a combination that need a little grooming now and then, sorting out seedlings of hellebores and replanting begenias now and then in addition to pruning the cornus. But that is just the start. The cornus could support a late-flowering clematis, that is hard-pruned in March and it is crying out for some spring-flowering bulbs.